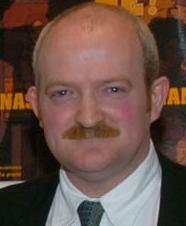 Colm Dempsey is the Coordinator of the “Violence against Women 365 International Poster Exhibition” since it first premiered in Dundalk, County Louth in January, 2004. He is a 46 year old native from Athenry, County Galway in Ireland. His knowledge around the complex issues of violence against women & children has emanated from personal and professional law enforcement experiences, and further enhanced from continuous professional development, academic qualifications and ongoing analysis of good practice from around the world. He has both attended & presented at prestigious international conferences and other forums on the issue of violence against women & children in Ireland, Northern Ireland, Scotland, Guernsey, England, Belgium, Canada, Switzerland and USA. He is a graduate from the University of Teesside, UK where in 2001 he received a Certificate in Professional Policing (Domestic Violence) and in 2003, graduating with MSc Masters Justice in Society researching “Domestic Violence and the Police : Perceptions and Expectations of Victims of Domestic Violence“. In 2008, he graduated with a Masters in Advanced Studies in Children’s Rights from the University of Fribourg, Switzerland where his innovative research was entitled ““Children, Young People & The Effects of Domestic Abuse: What are the influences or implications of the Convention on the Rights of the Child?”. He has also attended at the world-renowned Duluth Domestic Abuse Intervention Project, Minnesota, US undertaking a course entitled “Assessing your Domestic Violence Intervention System: Conducting a Safety and Accountability Audit”.